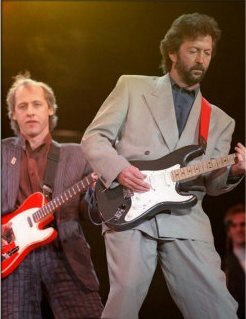 My girlfriend Anne and I had just been walking up the path toward the south gates when for some reason Eric Clapton decided to move his white Porsche 911 from the parking lot. Maybe he realized it was in the middle of the fan parking lot and might get dinged. It was around 6:00 pm and getting dark being mid September. The crowd was slowing filing in the entrance and my girlfriend and I were arguing about a blanket for the lawn or something as we walked up the long path. Had it not been for the couple in front of us we would have never seen Eric coming out of the darkness on our right side. He had to cross the path to get back into darkness heading toward the lot and with a hand covering his face walked right past us. Sure enough he had been seen by the guy in front of me. Dumb founded the guy turns to me and says “Was that Eric Clapton?” All four of us just stood in shock for a split second. Anne quickly says “Bill, go find out, go!”. Like a puppy running after a stick I said “ok” and jogged off into the darkness toward him. Eric was trying hard to hide by covering his face but he knew we saw him. He must have been scared to be out in the open away from all security too because he face had the Oh **** look. 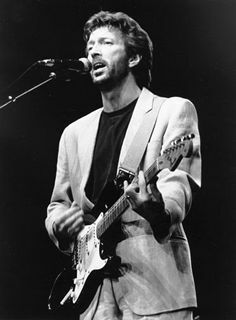 Being in shock myself I politely said “Excuse me sir,..Are you Eric Clapton?” He stopped walking, looked at me and said “yes, but please keep it down” in that English accent. I couldn’t believe it! I nodded yes ok and mustered up enough babble to ask for an autograph. He kindly obliged asking me for a pen and paper. Of course I had nothing but the blanket for the lawn seats. He was so cool about it and said I might have something in my car and we began walking together. My girlfriend watching all this from a distance realized it was him and ran up with the other couple. I asked her if she had a pen and in her excitement she turned toward the fans walking down the path about 20 yards away asking “Anyone have a pen?” Eric must have just thought “bloody hell kid! !”, and began to walk much, much, faster toward the safety of his car. I grabbed her and said come on and we all walked as a group with him the next 50 yards or so toward the tailgating crowd. We happened to pass my own car and quickly got some paper and a pen. Eric reached his car and accidently set off his alarm causing the slightly drunk tailgating crowd to look over. You could see the dumb founded looks as fans mumbled to each other, “is that? Nooooo…..It…nooo”. By this time a few people had noticed him and walked over. In fact one woman had a camera to my left side and was about to take a picture when I said don’t, shaking my head. I guess we all knew the risk he was taking by trying to sneak to his car. She pulled the camera back down realizing the danger too. I feel bad about it because it was a once in a lifetime thing but, still I was lucky enough already. Eric signed Anne’s paper and a couple others then mine as he stood at his open car door. He asked my name and wrote, “To Bill Enjoy the Show Eric Clapton” in a shaky script. He was a little nervous at that point being 100 yards from the gate and safety. I was still completely star struck though and didn’t mumble a word unlike the others saying “I play Bass”, etc. I think we all get a little dumb in front of legends like that. Some talk, some stare. 😀 Then in the most amazing moment Eric handed me back the paper and stuck out his hand to shake mine. I think I stared at his hand for 20 seconds even though it was a mere second. He must have seen my deer in the head light look and could relate to it when he met BB King or Buddy Guy. I shook his hand, said “Thank you”, and Anne and I walked away. I think we both knew the incredible moment we just had and felt for his safety too. Eric got in his car and slowly drove up the path into the back stage area. Wow mate, you lucky guy.